Today’s drum machines have gone from being a tool imitating various percussion instruments to being hi-tech composition machines complete with sequencing and synthesizer components built in. Though drum machines began their rise to fame in the 1980s with the burgeoning hip hop scene, their history can be traced back as far as the 1930s. At the time, the Rhythmicon was produced – the world’s first rhythm machine that could play sixteen pre-programmed rhythms. When it was released to the public, it struggled to sell beyond the initial PR period and the machine was soon forgotten. The next attempt at creating a functional drum machine came in the late 1950s with the loop-based drum machine known as the Chamberlin Rhythmate (1957), the first commercially produced drum machine Wurlitzer Side Man (1959), and a number of similar basic drum machine templates were released throughout the decade that followed. The 1970s are when drum machines began to be used in popular music. The first major #1 pop single in the United States to have a drum machine on it was actually Sly & the Family Stone’s Family Affair in 1971. Numerous experimental groups throughout the 1970s would continue finding unique ways to integrate drum machine patterns into their recordings. With the 1980s, drum machine technology had advanced to where digital sampling was now possible. Tracks such as Phil Collins’ In the Air Tonight, much of Prince’s work on his albums 1999 and Purple Rain, and Marvin Gaye’s Sexual Healing. In this period arrived the most popular drum machine that would ever be, the Roland TR-808, aka the 808. Introduced in 1980 and discontinued in 1983, it was one of the first machines allowing composers to create their own rhythm instead of having to use presets. The 808 would play a key component in the development of hip hop with its deep bass drums and idiosyncratic selections of sounds. The 808 has found its way onto more hit records than any other drum machine and can be held up today as one of the most influential instrument inventions of the last hundred years. Through the 1990s and into the contemporary period of music, drum machines continued to advance, adding in more features and capabilities. The introduction of MIDI programming in 1983 to commercial drum machines was a big step. At the same time, digital sampling continued on the rise alongside sequencers, software-based sequencers, looping capabilities, and real-time programming. The negative, dark side of drum machines and these advancements are that some major record labels – though not all – have gone to drum machines to create rhythm instead studio drummers. Though they still make standalone drum machines today, most musicians who use drum machine take them on through different software and multi-purpose hardware. The act of producing a rhythm by machine is one no longer dependent on human musicians or standalone hardware. As we step back into the history of the drum machine, from the 1980s to today, we have to acknowledge how important it’s been to the hip hop community in finding their own voice. From the beginnings with the 808 through to today’s landscape of different high-tech multi-purpose drum machines, you wouldn’t have hip hop if you didn’t have drum machines to toy with. 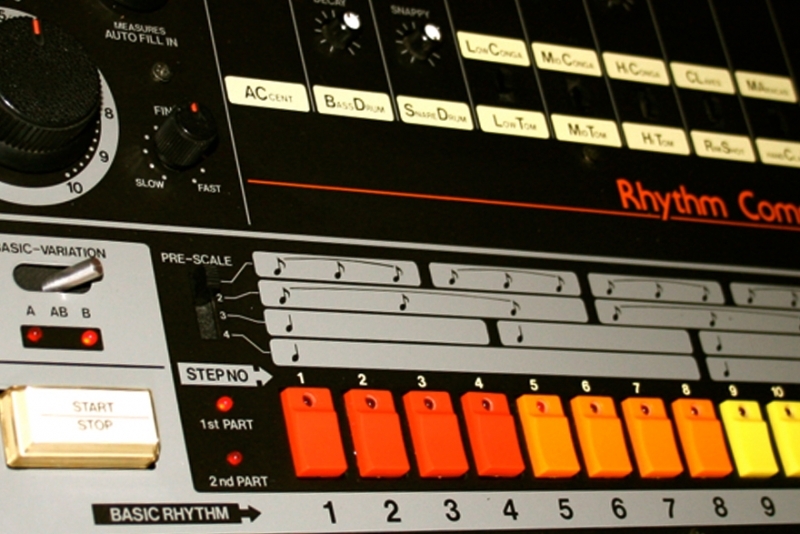 The ultimate legacy of the drum machine is that it’s what put the emphasis back on the beat. Drum machines successfully helped to shift consumer attention away from other aspects of music composition and instrumentation, to the creativity, power, and diversity of rhythm.